Alert for upper airway stenosis in a child with fixed obstructive airways pattern at spirometry. Ugan et al. reported an interesting case of 40-yearold female affected by Granulomatosis with Polyangiitis (GPA) that developed a Subglottic Stenosis (SS) in the remission period. Patient reported hoarseness and developed stridor. Laryngoscopy confirmed constriction in the subglottic region. Although life-threatening and plays an important role in morbidity, patients may show progressive Subglottic Stenosis (SS) even in the remission period. Authors argue that it can be the first and only symptom of the SS disease despite being very rare. We report a 13-year-old girl with three years history of recurrent stridor, nocturnal snoring and apnea. Family history reported a brother with allergic rhinoconjunctivitis and a grandmother with hypothyroidism. The girl had a normal perinatal history and never intubated. An initial lung function test showed a restrictive pattern. Angio RMN (Resonancia Magnetica Nuclear) of the neck was normal. At thoracic examination they heard together a diffuse inspiratory and expiratory wheezing with prolonged expiration time. Respiratory rate was 20/min, transcutaneous oxygen saturation (Nellcor oximeter) was 99% in room air. Other clinical remarkable signs were absent. Extensive blood tests showed positive antinuclear antibodies (1:80), Antineutrophil Cytoplasmic Antibodies (ANCA) and other rheumatologic tests were negative, hyperthyroidism (Thyroid-Stimulating Hormone-TSH 0,009 mUI/L; FT4 23.8 ng/L; Free Triiodothyronine-FT3 10.5 pg/mL) and positive anti-Thyroperoxidase antibodies (3428 UI/mL). She started medical therapy with tapazole. An echocardiogram excluded aortic arc anomalies, an Electrocardiography (ECG) showed sinusal arrythmia. A 24 hr pH-metry test excluded gastroesophageal reflux. A flexible fiberoptic laryngoscopy showed a narrowing nasal aditus/cavity with haematic scabs and a concentric subglottic stenosis extending toward proximal trachea. The fiberoptic bronchoscopy showed a normal endoscopic appearance of distal tracheobronchial tree. Pulmonary function tests showed a poor or absent response to inhalant bronchodilators. The flow-volume loop showed a fixed obstructive airway pattern (Figure 1). An MRI confirmed a restrictive SS. The investigations performed pointed-out for GPA and methotrexate and oral steroids was started. A clear improvement of quality of life has followed the medical therapy. From a clinical viewpoint, during which the girl was followed-up, no asthmatic symptom was reported. The patient is now under regular follow up with no evidence of stridor, dyspnea or airway obstruction symptoms. One month after the medical treatment, flexible fiberoptic examination showed a 50% reduction of the subglottic stenosis. 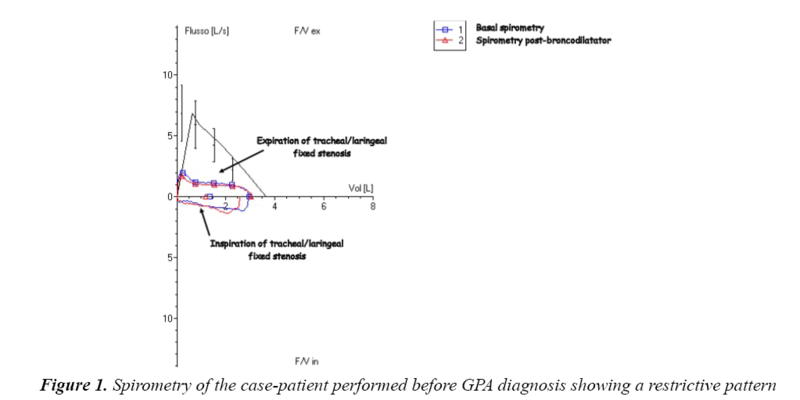 Spirometry, addressed to bronchial involvement in adults, is a challenging technique to initial and follow-up investigation of high airways obstruction in patients with GPA . SS is five times more common in children with GPA than in adults, presenting at any age regardless the disease severity and duration. In a 20-year-old girl with GPA, laryngotracheal stenosis was misdiagnosed for 6 years as asthma although multiple spirometry showed an unmistakable pattern of upper airway stenosis and minimal reversibility to inhalant bronchodilators from the age of 14 years . GPA is a rare disease with 8 cases/million/year. The disease presents as a triad of respiratory, vascular or kidney location and is unusual in paediatric population, with worse prognosis. Diagnosis is often delayed for years because of unclear/insidious manifestations at earlier stages. This case may be educational when considering the differential diagnoses of recurrent stridor and sleep apnea episodes. Subglottic stenosis has been reported as a significant consequence of upper airway involvement of GPA [4,5]. The diagnostic values of spirometry, laryngoscopy and magnetic resonance imaging for GPAcaused subglottic stenosis were also reported . Informed consent was obtained by parents. Given the feasibility, we hope that the spirometry can be addressed at diagnosis and follow-up of GPA to alert for high airways obstruction and we look forward to more comprehensive literature data and experiences from other Centres with skills in this disease. Ugan Y, Dogru A, Aynali G, et al. A clinical threat in patients with granulomatosis polyangiitis in remission: Subglottic stenosis. Eur J Rheumatol 2018; 5: 69-71. Latorre M, Baldini C, Seccia V, et al. Asthma control and airway inflammation in patients with Eosinophilic granulomatosis with polyangiitis. J Allergy Clin Immunol Pract 2016; 4: 512-519. Nunn AC, Nouraei SA, George PJ, et al. Not always asthma: Clinical and legal consequences of delayed diagnosis of laryngotracheal stenosis. Case Rep Otolaryngol 2014; 325048. Fijolek J, Wiatr E, Gawryluk D, et al. Intratracheal dilation-injection technique in the treatment of granulomatosis with polyangiitis patients with subglottic stenosis. J Rheumatol 2016; 43: 2042-2048. Schirmer JH, Wright MN, Herrmann K, et al. Myeloperoxidase-antineutrophil cytoplasmic antibody (anca)-positive granulomatosis with polyangiitis (Wegener's) is a clinically distinct subset of ANCA-associated vasculitis: A retrospective analysis of 315 patients from a german vasculitis referral center. Arthritis Rheumatol 2016; 68: 2953-2963. Henes FO, Laudien M, Linsenhoff L, et al. Accuracy of magnetic resonance imaging for grading of subglottic stenosis in patients with granulomatosis with polyangiitis: Correlation with pulmonary function tests and laryngoscopy. Arthritis Care Res (Hoboken) 2018; 70: 777-784.